Criacr Bluetooth FM Transmitter, Wireless In-Car Radio Transmitter Adapter with Hands-free Call Car Kit, 5V / 3.4A Dual USB Charging Port Car Charger for iPhone, Samsung, etc. - Plug the FM transmitter into your vehicle’s lighter or power port. The LED displays the voltage of car battery 5 seconds. - Then the device enters into Bluetooth pairing mode, LED displays BT & FM Frequency. Turn your radio to an unused FM frequency, then match this device to the same frequency. ▲Please change another stable channel if it has a lot of static because of frequency conflict. ▲Find an empty station and keep the FM transmitter and car FM radio at the same frequency. ▲In the music playing mode,when there is an incoming call,this unit will automatically switch to telephone mode. Dual USB Charger Ports - 3.4A dual USB charger ports can simultaneously charge two devices, intelligent shunt to ensure that the current is stable and fast charging. Blu-ray LED display intelligent display voltage, real-time monitoring of automotive voltage, low voltage voice alarm, built-in led lights, night driving more secure and convenient. 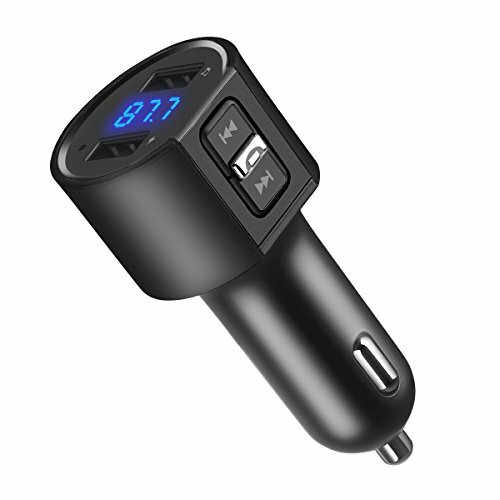 Multi-Purpose - This car charger support the Bluetooth connection phone and car charger, you can put navigation, music, telephone voice to the car radio, phone ringing sound, music automatically paused, through the car audio to hands-free call so that driving more secure. Compact Design - This fm radio transmitter with mall size, seamless integration of the fuselage design, ABS fire heat-resistant materialhigh hardness, durable, not easy to scratch, aluminum alloy metal ring, pure copper USB electric shock, greatly increased the service life. Safety Protection - Intelligent control chip provides a safe circuit protection, improve the charging efficiency, short-circuit protection, over-voltage over-current protection, intelligent anti-interference, make FM/Bluetooth signal stability. Intelligent cooling system can quickly release the heat generated by the car charger to keep the charger stable. Widely Compatible - Support for Apple/Android and other mobile phones and other digital products such as IPAD, navigators, PSP, MP3, digital cameras, etc., and supports voltage in 12-24v various cars. If you have any questions about this product by AMIR, contact us by completing and submitting the form below. If you are looking for a specif part number, please include it with your message.